Dr. Jeanne Booth ’76, ’88 MEd, associate professor of counselor education, has been named Counselor Educator of the Year by the Virginia School Counselor Association. The mission of the Virginia School Counselor Association is to promote excellence in the profession of school counseling and to provide member support through professional development, advocacy, leadership, accountability and collaboration. 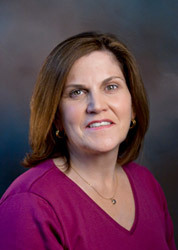 Dr. Booth has also been elected president of the Virginia Association of Counselor Educators and Supervisors, and will begin a two-year term on July 1, 2011. Prior to joining the University of Lynchburg faculty in 2000, Dr. Booth worked with the Lynchburg City School system as an English teacher, professional school counselor, and guidance director. A University of Lynchburg alumna, Dr. Booth teaches graduates, as well as undergraduates enrolled in the College’s teacher preparation program. A nationally certified parent education facilitator, Dr. Booth also serves on the staff of the College’s Center for Family Studies and Educational Advancement. Dr. Booth has made presentations at the national, state, and local levels on issues related to counseling, human development, childhood obesity, parenting issues, and family dynamics. She also provides consulting services and workshops for school divisions and public and private organizations throughout the commonwealth.